At the dawn of digital, many had predicted “the end of branding as we know it,” and while the discipline of branding has changed dramatically in the past decade, having a distinct, valued and engaging brand is more critical than ever before. Increased competition, commoditization and the speed of change call for brands to become the point of convergence and the catalyst for the alignment of business strategy, customer experience and company culture. This new view of brands requires a new approach to brand management – an approach that is less rigid and more agile; less like a brand bible and more like a playbook. In the past, brands were meant to be above all consistent – managed with an ironclad set of rules designed with one goal in mind: for the brand to remain intact and unchanged. Today, the view of brands as static symbols is not only outdated but also ineffective. This means that the old practice of stringent brand guidelines, brand policing and full ownership by the companies that created them must yield to a new approach of brand governance. Today’s brands must be fluid, adaptive and always evolving to keep up with the speed of change. Yet, they still need to be grounded in a company’s business strategy, steeped in its culture, relevant to its audiences and immediately recognizable across numerous communication channels. In other words, they still need to be distinct and enduring. So how do you achieve brand differentiation and recognition – the core attributes of a strong brand – and agility at the same time? The answer lies in the one thing your brand needs to be built for above all else: responsiveness. An agile brand is not one that acts as chameleon. It doesn’t change its soul, or even its most valuable attributes, pending the situation. Rather it responds to the situation authentically, just like people who adapt to circumstances without letting those circumstances change who they are. This means that for a brand to achieve agility and consistency at the same time, brand managers need to ensure the brand has the foundation from which it can, in fact, be responsive. To put an even finer point on this, a brand needs a foundation from which it can be responsive without becoming either weak or irrelevant. To help you strike the balance, we’ve identified five building blocks – the essential principles of the modern brand. Holds an Uncompromising Position. The brand doesn’t try to be all things to all people – rather, it owns a unique place within its competitive set, and this position is consistently reinforced. For example, a brand that’s positioned as the innovator in its category can’t also be the “low-cost” option. Defining your stake in the ground first gives your brand room to flex while remaining true to its core. Driven by Purpose. The brand has a defining purpose that acts as its north star. It engages all company stakeholders by inviting them to be a part of something meaningful, something bigger than themselves. Thus, purpose-driven brands are inherently more relevant, and the guiding clarity of purpose allows them to adapt without a compromise. Imbued in Value. The brand must have a single promise that shapes how the outside world – regardless of the markets, industries or audiences served – thinks of the company. While the brand promise directly informs the company’s value proposition, to create greater meaning and relevance, the value proposition should be further tailored to meet the needs of various audiences. The value proposition may be different for individual markets and audience groups or for prospects versus existing clients. The most common practice is to have separate value propositions for customers and employees. Has a Distinct Personality. The brand has a strong personality that defines its point of view, plus a tone of voice and design and copy style for all marketing communications. So, no matter where your brand shows up – on LinkedIn or at a live networking event; at a tradeshow or company party; in an email or on a landing page – it can be always recognized as your company’s brand. Having a distinct personality enables the brand to be agile, adapting its behavior to specific audiences, communication channels and touchpoints without losing its core character. Primed for Omnichannel. The brand does not simply engage on multiple channels but also adjusts its message for the channel and the audience, as well as where its customers are in the buying cycle and their relationship with the company. Omnichannel marketing requires brand managers have as much knowledge about their audiences and their context as about their own brand. The above foundation for responsiveness (consistency + agility) gives brand managers the ability to remain nimble while evolving their company’s brand to engage on new channels, adapt to new formats and employ new marketing technologies without compromising the value of a strong brand. The most critical aspect of effective brand management under the new rules is understanding the essential nature of your brand so deeply that you’re able to improvise in the moment without getting off brand. Whereas traditional brand management focused solely on establishing, teaching and enforcing strict brand rules to prevent the brand from getting “messed up,” the new brand management involves making sure that all stakeholders are deeply entrenched in the brand so that they’re able to deliver on the brand promise in multiple scenarios and under a wide range of circumstances. Of course, brand guidelines still apply and need to be referenced, but they are simply a tool – one of many – for managing a brand, not the end-all-be-all of brand governance. The last bullet signifies the change in the mindset and empowers brand practitioners responsible for how a brand is seen and experienced by the outside world to become true brand advocates not brand keepers. 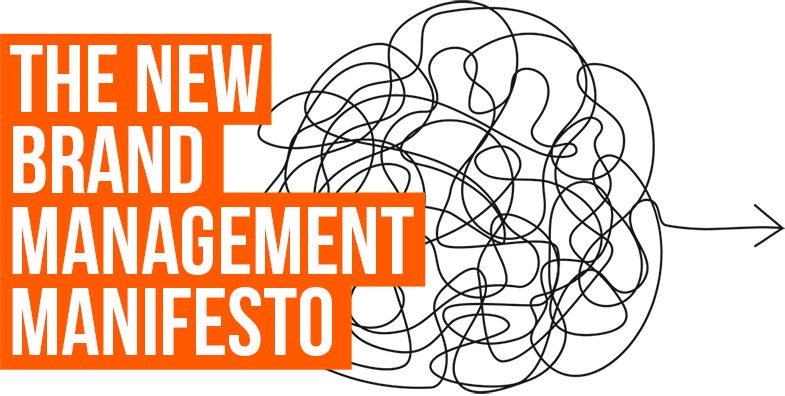 Simply put, the new brand management is about developing a brand-based culture through effective employee engagement, education and training that ultimately leads to a more brand-based customer experience. Once you recognize that the primary difference between the old and the new is the ability to create more than brand differentiation, but a differentiated brand experience, it’s easy to see why following rigid guidelines to a tee is no longer enough. Since no one can possibly predict all the situations in which your brand will need to be responsive, brand education and having the right policies and tools are essential to ensuring that every person involved in executing and living the brand can act on-brand in any situation. And so instead of the old brand bible, we suggest a brand playbook. Rather than blindly following a strict set of rules, the team, or an individual, can call a play appropriate for each situation. As long as the team knows the game extremely well, they can write their own play if needed in response to what’s happening in the moment. In other words, the new brand management framework allows room to play because the foundation that gives your brand meaning and makes it recognizable, differentiating and an inseparable part of your company’s culture is so strong. At Substance151, we help companies develop strong brands and brand touchpoints that create the foundation from which to activate the brand internally, creating a brand-based culture and a fully aligned customer experience. Contact us and let’s discuss how we can help you build your brand and your brand management playbook for today’s business environment.